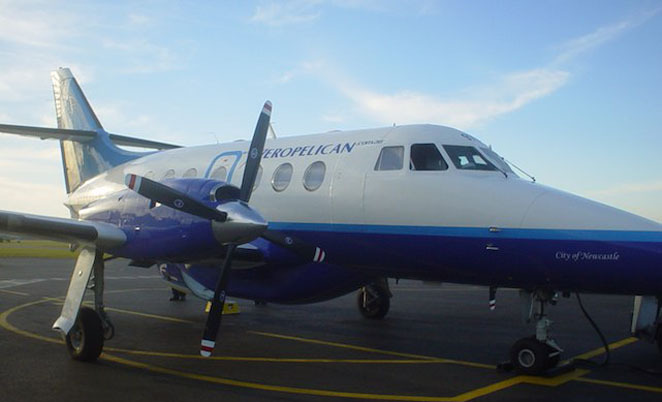 Pelican Airlines operates former Aeropelican Jetstream 32 aircraft. This is wonderful news for people like me who regularly fly to Canberra and Sydney from Newcastle for business! I just wish I hadn’t already booked my June and July air travel! Well done for offering this service! It will save so much time and money! At the moment I have to fly to Canberra via Melbourne and it wastes an entire day! Brave move by the new Pelican. Its up to the NTL community to use it or lose it. Once you compare the hours lost by travelling over Sydney any fare that has to be charged is justified. Even with a loyal staff the costs of any aircraft like the J32 will be high. The States and Governments within Australia need to work out ways to protect and encourage air routes that cross State borders in the same manner that Intra-state services attract subsidies. Our State-lines / internal borders are such a hopelessly artificial construct. Moderately sized regional centres often have as much natural linkage with regional cities and inter-state capitals as they have their own state capital. Trade and growth in air services is hopelessly centred on and restricted by the traditional State borders. Support it – or lose it. And an observation, not aimed at Newcastle or Canberra in particular – but don’t complain about the aircraft size etc. Previously we have seen folk in Toowoomba complain about the “slow little propeller plane” that Qantas runs from Toowoomba to Sydney – yeah, a Dash 8 400, which beats the hell out of the drive to Brisbane and mucking around to get a Jet to Sydney. The Griffith (NSW) local paper’s letters grumped and grizzled about the “little propeller plane” to Essendon – Cessna 404. I have used that service too, both directions, and it is fantastic to have a lower and “different” flight, and way better than the drive. The J32 for NTL/CBR is right sized for a route like this. Unfortunately Brindy went a bit overboard with the J41 with cabin crew etc……it’s not a big plane, it’s not a jet – but it will be much better than mucking around with a transit in Sydney, and way better than a drive.